THOMPSON-AMES HISTORICAL SOCIETY HOSTS JOINT MEETING WITH LACONIA HISTORICAL SOCIETY On Monday evening, October 2nd, 2006, Gilford's Thompson-Ames Historical Society will host the annual potluck dinner and joint meeting with the Laconia Historical Society. Potluck supper will begin at 6 p.m. followed by a brief business meeting and program at 7:30. This get-together will take place at the Gilford Community Church and the public is welcome. Join us as this year's featured speaker, Dr. Judith Moyer, Assistant Professor of History at UNH, presents her program, "Clean Milkers, Prompt Delivery: New England Home Milk Delivery, 1860-1960". This talk traces the development of home milk delivery in New England through the newly industrialized American cities up to suburban doorsteps. 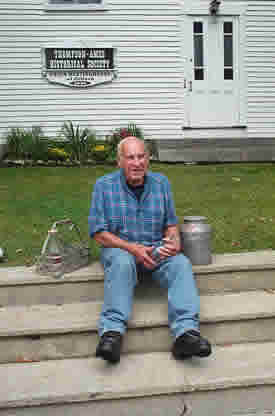 When wanting to learn first-hand about the home milk delivery business in Gilford, one only needs to interview well-known resident, Pete LaBonte, who grew up on his family's dairy farm which was located on Hoyt Road in Gilford. Pete's father, Arthur J. LaBonte bought this farm in 1930. It was the last working dairy farm in Gilford, which closed its doors forever in 1985. The LaBonte dairy barn usually housed 75 cows and about 50 were milked each day, twice a day. A farmer's day would start with a milking at 5 a.m. As the milk was transferred from the milking barn to the milk room where it was cooled, breakfast was eaten. After the milk was put into glass milk bottles (which are now considered collectibles) and paper caps put onto the tops, Arthur LaBonte would then load the milk into his delivery vehicle and head off to customers in Gilford, Laconia and Lakeport. Another collectible from this by-gone era, is the "milk carrier", which is a metal basket with handle that would hold the glass milk bottles. During the interview for this article, Pete LaBonte proudly donated his father's milk carrier to T-AHS and its accompanying LaBonte Farm milk bottle with paper cap. It will be displayed in the farm section of the Union Meetinghouse in Gilford. Pete, who would sometimes fill in for his father on these routes, has many fond memories of the days of home milk delivery, or "peddlin' milk", as he calls it. When asked if winter snowstorms would cancel any of the deliveries, Pete replied, "Oh, no, the deliveries just took longer, that's all!" Home milk delivery was a 7-day-a-week job, but, as Pete said, "We re-arranged our schedule a little on Sunday so that we could still attend church." LaBonte's customers enjoyed having their milk delivered right to their doors. They did not have the metal milk boxes that some of us still remember having outside our front doors. Rather, these customers were actually given their milk bottles by either Arthur or Pete. If a customer was not home at the time, the milk was left by the door and in winter it would freeze without any detriment to the milk. This milk was fresh, raw milk and was a combination of the milk from the milking of the night before and the morning's milking. Raw milk, as so many of us remember, has delicious cream that rises to the top which can then be skimmed off and made into butter. Pete was quick to add in that his family was not the only family who owned dairy farms and who peddled their milk. Family names that we all recognize in the town of Gilford such as: Sawyer, Wilson, Bolduc, White, Weeks, Drouin, Swain, Harris, Peters, and Dutile, were all families that Pete fondly remembers. Pete also mentioned that when he sat and counted the number of farms (not necessarily dairy) that he remembered in Gilford, he came up with a total of 32. That's quite a large number considering the size of this town. Gilford's history is firmly rooted in farming. After many, many years of peddling 14 cases of milk per day, 12 quarts to a case, Arthur LaBonte, in 1970, switched to the modern method of milk delivery, which is called bulk delivery. A milk truck would arrive at the LaBonte Farm and all of the day's milk would be hauled away in bulk. Gone were the days of home milk delivery. In speaking with a now-retired, very happy and healthy Pete LaBonte, we can see that the farming days in Gilford were good ones; days that were spent out-of-doors in all weather and in all seasons. It's an era in Gilford that is very much missed by those who lived through it, and for those who didn't, we certainly enjoy hearing about all the great memories from residents such as Pete LaBonte. For more information about this joint meeting, please call Gilford's Thompson-Ames Historical Society at 527-9009 or visit our web-site at gilfordhistoricalsociety.net. T-AHS wishes to thank the Samuel P. Pardoe Foundation for their generous funding of our 2006 programs which include Dr. Judith Moyer's dairy presentation.